152 Insights to My Soul: And then there was a knot. And then there was a knot. When Ben got a major hair cut earlier this month, the scar at his hairline was more visible. It happened a day before the hair cut when we were at Venture River water park with friends. I was sitting in a tube and Ben was in my lap as we went down a slide. Somehow the momentum pushed us forward without our tube when we were a little ways down. I managed to hold on to Ben and get us back on the tube to finish the slide into the small pool of water. I didn't realize until later that Ben's head must had scrapped against the slide because he had a wound on his forehead. Fast forward three weeks later. 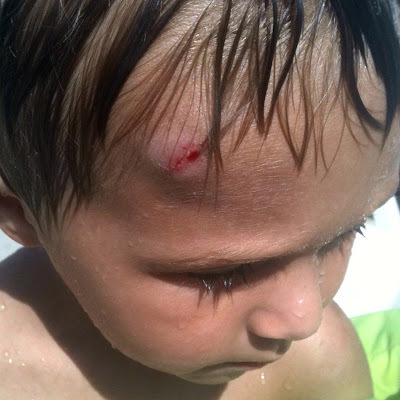 While walking up to the same slide on Friday, Ben said, "No hurt head." He remembered. Of course, my mom and I reassured him that he'll be fine this time. We'd gone down it multiple times that first day before our bumpy trip down, so I was confident odds were in our favor. So my mom -- better known these days as Grandmom -- was rolling a huge family tube up the hill to the top of the slide when it accidentally fell away from her and knocked Ben into a concrete wall. As soon as he came out from beneath the fallen tube, a bloody knot appeared on his forehead. Never have I seen a knot show so quickly. My instinct was to get ice so I took off, with Ben in my arms, to the concession stand. I saw a first aid sign along the way and then spotted a life guard, who led me to the first aid area. The kind lady there cleaned it and told me when her boy was little the doctor told her knots that popped out were better than ones that didn't because they relieve internal pressure. And the blood was coming out, not staying in. Still. Of all Ben's scraps and bruises and burns, this one scared me the most. And it was right on top of his already existing scar. But he's brave, I tell you. After some cuddles and reassurance, Ben went back down the same slide. Thankfully, the knot went down overnight. A bruise remains under the scar on his forehead. But, really, what are the chances a boy hurts is head in the same exact place twice while at the same water slide?! Leave it to my boy to make it happen. Perhaps I do need to buy some more of that anti-scar cream.